Way to spoil the episode, episode title! The gals are just finished having a big party with lots of food [These gals have a more active social life than I ever did CAN I GET AN AMEN?] and they are cleaning up and Sophia gets a “bubble” in her chest and has to lie down. 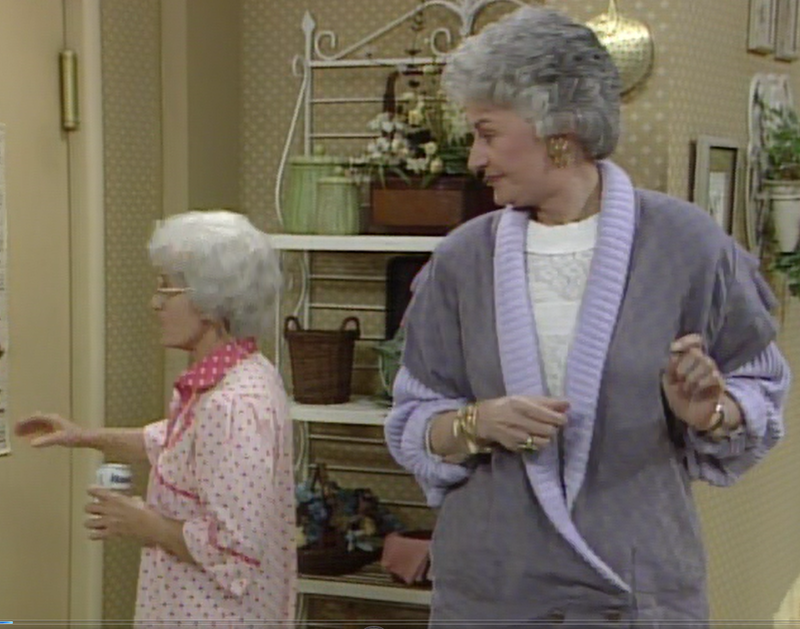 Blanche calls the paramedics and Sophia is a stubborn old lady and insists it’s not a heart attack! 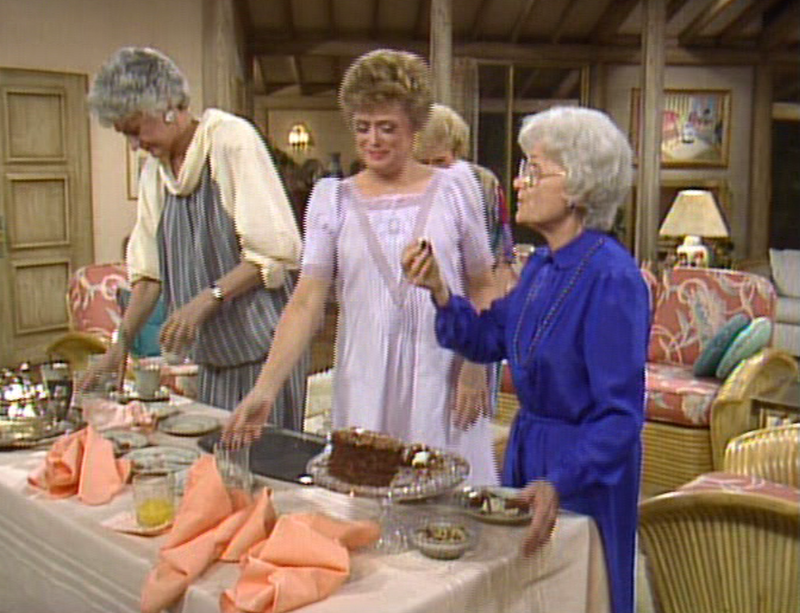 Dorothy freaks out and admits to Rose that she’s not ready to be an orphan. It’s been about ten minutes in real time and the paramedics don’t come because there’s a storm, so they just…wait. It’s pretty bleak and if I didn’t already have the rest of the seasons on dvd from Amazon, I’d think this would be the end. 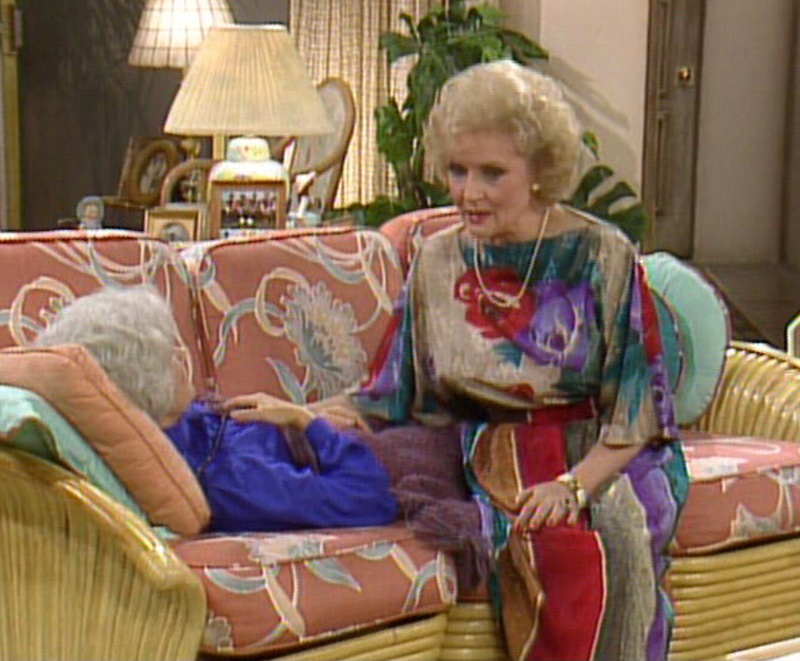 Then Rose has a confession: her husband Charlie had a heart attack while they were “making love” as Rose would put it, Blanche would of course put it a cruder way. Remember this fun fact for a later episode. To the surprise of no one, it turns out it is because Sophia ate too much that day, including Fettucine Alfredo, stuffed mushrooms, ravioli, veal, and about a hundred other “my mama’s Italian cooking!” dishes. In fact, she’s having a gall bladder attack. Does that really happen? Don’t people just get indigestion? Fashion talk! Sophia is wearing the cutest little blue dress through this whole thing, and I LOVED Rose’s dress.